This is so special ! As you know I train teachers and other professionals all over the UK , as well as further afield , in my massage techniques for children and young people with special or different abilities as well as for those kids just having a really tough time . Well during the Spring 2017 term I trained a really dedicated staff member from one of my local schools which is part of a six school academy within the Exmoor Coast Federation . 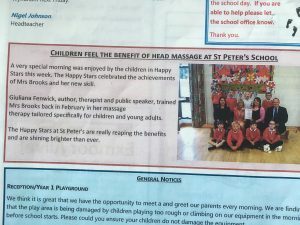 Mrs Kerry Brooks of St Peter’s First School in Williton, Somerset took the massage into her group of special children called the ” Happy Stars “and the children began feeling the benefits straight away, all of which are being carefully monitored by the school. 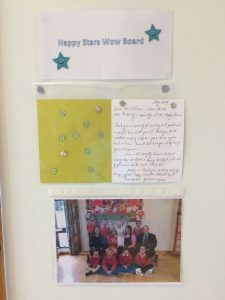 The therapy is having such positive effects that advanced training is already being undertaken with further courses and Mrs Brooks also helps me with my Rainbow Kids Club in her own time , taking the story massage techniques and meditations back to her Happy Stars. 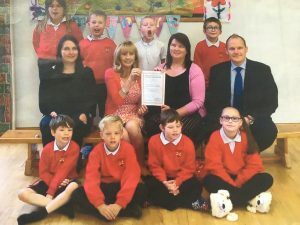 It is just beautiful to watch those children – and Mrs Brooks ! – bloom ! 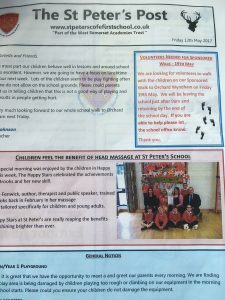 It has been such a success that just before half term I was invited by Mr Nigel Johnson, the headmaster, Kerry Brooks and the Happy Stars for breakfast one morning ! They made me toast and croissants which was bliss because I always skip breakfast ! A happy and delicious time was had by all and it was so magical to actually meet the children who are benefitting so greatly from the therapy. Usually I train parents, carers and professionals but seldom get to meet all the children so this occasion brought me a deep and long lasting joy. I will treasure that morning for a long time . The Happy Stars always wear their slippers by the way , so I felt it was only polite to bring my own. I’m not quite sure what the local press made of that but we had a ball and it was absolutely lovely to sit in the middle of all those wonderful children and listen to their voices and their stories. It was so good to meet everyone and I’ve been invited back for a story massage morning or afternoon very soon where I can share even more with this very special bunch …. 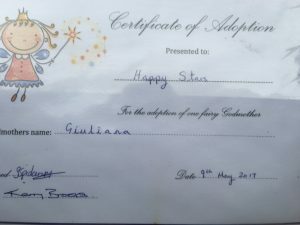 I even received a certificate in the post informing me that I have been adopted as their fairy godmother ! A beautiful and special time I shall treasure .